This unusual and interesting surname is of early medieval English origin, and is either a topographical name from residence by the old gates of a walled city, or a locational name from the hamlet of Aldgate in the former county of Rutland. The derivation is from the Middle English "old", a development of the Olde English pre 7th Century "eald", old, with the Olde English "gaet", gate. Topographical names were among the earliest created, since both natural and man-made features in the landscape provided easily recognisable distinguishing names in the small communities of the Middle Ages, and locational names were originally given as a means of identification to those who left their birthplace to settle elsewhere. The following interesting entry appears in the Baptismal Register of St. Botolph without Aldgate, London: Buttolpe Aldgate, an infant, christened on October 25th 1583. On September 30th 1613, Ellen Aldgate and Henry Smith were married in Oakham, Rutland, and on March 4th 1646, the christening of Ambrose Aldgate took place in Thurlby near Bourne, Lincolnshire. 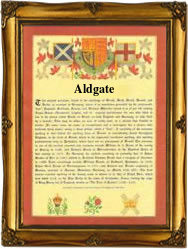 The first recorded spelling of the family name is shown to be that of John Aldgate, which was dated December 13th 1551, witness at the christening of his daughter, Elizabeth, at Sandy, Bedford, Bedfordshire, during the reign of King Edward V1, known as "The Boy King", 1547 - 1553. Surnames became necessary when governments introduced personal taxation. In England this was known as Poll Tax. Throughout the centuries, surnames in every country have continued to "develop" often leading to astonishing variants of the original spelling.